Rema W. Dassouki, an attorney with Thurswell Law, specializes in personal injury cases, including automobile negligence, truck, bus, motorcycle, bicycle, boating, and pedestrian accidents, slip and fall accidents, dog bites, and police misconduct. She was a student trial lawyer for the Washtenaw County Office of Public Defender, where she was awarded the Certificate of Professional Achievement Award. Ms. Dassouki earned a bachelor’s degree in political science with a co-major in peace and conflict studies and a minor in psychology from Wayne State University. She received her Juris Doctorate from the University of Detroit Mercy School of Law, where she was a recipient of the Dean’s Scholarship Award and Health Law Law Firm Program Book Award. She served as President of the Muslim Law Student Association and President of the Middle Eastern Law Student Association. 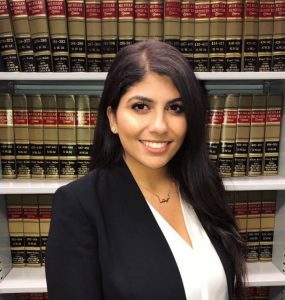 Ms. Dassouki also spent her time in law school obtaining her 40 hour training in civil mediation and worked as a student attorney for the Detroit Mercy Law Immigration Clinic. Ms. Dassouki was admitted to the State Bar of Michigan in 2018. Ms. Dassouki is fluent in Arabic. Contact Rema W. Dassouki Thurswell Law attorney, today for your free consultation.